Grab those 9 Disney games, a special promotion of worth $17 from Microsoft and Disney are now free until June 17. 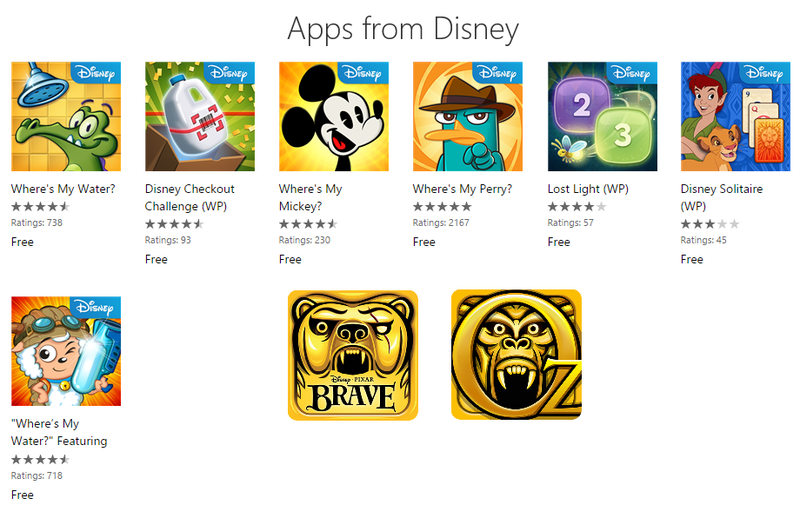 Here are the list of Disney games on windows phone that are free for the next week. Where’s My Perry is a challenging physics-based puzzler where you need to use water in all its different forms - ice, steam and liquid - to solve the puzzle. Overflowing with intuitive controls, vibrant spy-themed graphics, and best of all, lasers, you will be immersed in the world of Agent P! Play a challenging solitaire adventure game against the backdrop of timeless Disney classics in Disney Solitaire! Travel through beautiful level maps based on Peter Pan and The Lion King as you play solitaire, overcome villains, and meet your favorite characters along the way! Connect and match your way through this captivating NEW puzzle adventure from Disney! Journey to the heart of an enchanted forest and help restore the light hidden away by the wicked Beasties. Enter the world of Lost Light to experience a brand new kind of matching game with a unique numbers twist! Do you have what it takes to climb the ranks from “Checker-in-Training” to “Checkout Chairman”?!? Test out your grocery scanning skills in this fast-paced, deceptively simple supermarket challenge! GRAB groceries, SCAN barcodes, COMPETE for the highest score!